Hardware: What&#039;s in my bag? I’ve been reading a tech site called The Verge for about a year now (or since they launched at any rate) and one of my favorite features that they do is their “What’s in your bag…” series. In these articles they take someone from their staff, or even guests, and ask them to write about the bag they carry everyday and what’s inside it typically. Not only do I find this topic oddly fascinating, but it’s also a great way to see what other folks in your field are using in their day to day to make whatever systems they have in their lives run smoothly. The writer in me also loves how it is a bit a character study as well. Anyways, I’ve been meaning to do that here in this space for a while and finally found the time to take pictures this week. So, much thanks and credit goes to The Verge for the idea and I hope you enjoy! Sure, there are other things that will sneak into my bag from time to time, but this is what I typically have in it everyday! Now if you are already bored out of your skull, you might as well head back to your Twitter or Facebook feeds. But if you have that same curiosity that I have, stick around! Because I’d love to tell you about these things individually and show you why I carry around this stuff everyday. Still here? Awesome. Let’s dive in shall we? Little to no noise bleed. I hate disrupting my neighbors. Comfort. Good padding for prolonged use. Above average sound quality. I am not an audiophile per say, but music is extremely important to me. A long cord. I don’t want to take them off or have them yanked off my head when I reach for something behind me. I already had a few folks that I trusted for reviews, chief amongst them Marco Arment, and when I found his comprehensive reviews of headphones last year like this one on his site, he frequently referred back to this pair of Sennheiser’s as his main pair for listening to anything hours on end. I bought them from Amazon and have yet to think of buying another pair. They are very comfortable, have a long spiral, springy cord, emit very low noise bleed and the sound quality is exceptional. As I’ve mentioned many, many times on this site; I am a Mac user. It’s nothing personal. I use PC’s and Macs all day at work and OSX is just fits my life and my daily workflows best. Both platforms have merit. That all said, I spent around 8 months trying to live without a laptop, utilizing just my iPad and a bluetooth keyboard, and the gaps where a laptop could’ve really sped things up for me became too hard to traverse. So I had to go back. I’ve been using the 13in MacBook Pro with Retina Display for everything about two months now and I can honestly say, without a single shred of doubt, that this is the finest computer I’ve ever owned. And for those who are wondering if the screen is worth the extra cash: yes, it really is. The bag I settled on is the REI Quantum Messenger Pack from REI. It’s nothing incredibly fancy but it’s got a padded sleeve for my computer, lots pockets for pens, notepads and all of my accessories, nice touches like a felt-lined pocket for your smart phone, mesh pockets for easy line of sight for anything you don’t want to dig around for, thickly padded shoulder straps… seriously, its a really great bag! What sold me on it though was the bag-length zipper on the side that unzips directly into the laptop sleeve so that it’s easy to take it out and put it back in while traveling. It’s not all that expensive either if you can find it (it looks like it’s no longer on REI’s site). I am, at times, a woefully impatient person. Especially when it comes gadgets and upgrades. If you have ever needed a computer screwdriver set in a pinch and didn’t have one on hand, you’ll know what I am talking about. If you have never needed a set, you probably view it as extra bulk. I have needed them, several times in fact and after the last time, I stopped off at Lowes on the way home and snagged this set. I paid very little for it and I will definitely need a new set soon, as the heads are chipping and stripping from use over the years. My next set will be better quality for sure. The whole set, when zipped closed, is quite light and takes up very little room. I just tuck them in, down at the bottom of my bag. To this day, I am still shocked at how much I reach for these little guys. Like the screwdriver set above, I am shocked at how many times I need a good pair of needle nose pliers, or a good knife, or philips head, or a wire cutter, or a bottle opener, or a… well, you get the point. 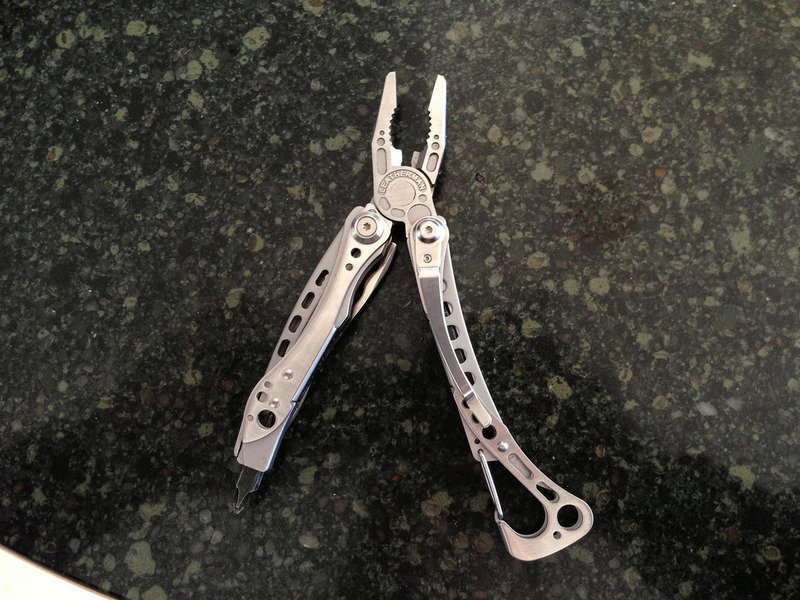 I use the Skeletool both for hiking/camping, as well as my day-to-day. It’s light for what it is, but also incredibly well built. Again, when I’ve needed it, I’ve been so psyched that I had it in my bag. It’s incredibly adept at solving problems. These poor bastards have been through the wringer and are also hands down my least favorite Apple product. But, that all said, I keep them in my bag for when they are spatially more appropriate or when I am only sitting down for a few hours of work. The cord is too short, the sound is ok and, as you can tell from the glue on the ear pieces, they are falling apart. 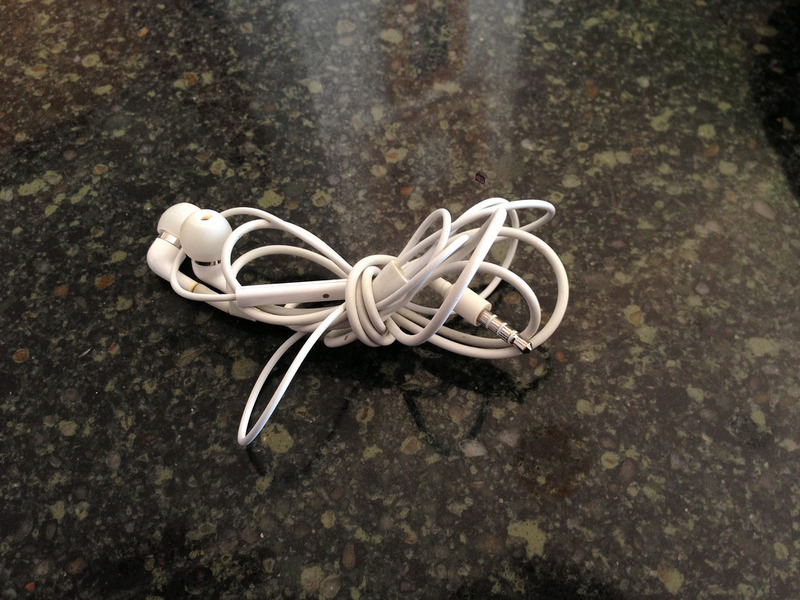 I basically keep them in my bag because they get the job done, but also I wouldn’t be bummed if I left them somewhere. I move files around from computer to another a lot. I also like sharing. So in the case where items are too big to attach to an email or you aren’t networked directly to your needed destination: thumbnails drives are still pretty damn convenient. Mine were cheap and the only reason why I keep to 2gig one around is because it still works like a champ. Mostly I always go for my 32gig one. Incredibly handy when you need to offload pictures from a USB device to your iOS device. Also an amazing adapter to add to your travel kit. The Thunderbolt to VGA adaptor is solely for work purposes. Because you’d be shocked at how many office projectors/monitors still use the old-school VGA connections. If you ever are traveling and have wanted to plug your MP3 player into a stereo wherever you hang your hat for the evening, this cheap little cableis a must! Just plug it into the head phone jack of your player and connect the red to red and the white to white on the back of any stereo you encounter. After a long day on the road, I am always relieved when I get to listen to my tunes through speakers. It’s not possible without this little travel companion. You can find them in almost any store in town, including most grocery stores (I bought this one at a local RadioShack on our last vacation). I could seriously write an entire separate post on this tiny wonderful gadget (and I most likely will) , but this post alone is getting pretty epic so I will keep it short. Square is basically an online service that allows you take credit card payments with your phone or tablet device. Just plug this card reader into the headphone jack of your phone, download Square’s app and you are ready to take payments from anyone. If you do freelance work or even run a full-fledged business, this little piece of plastic is a godsend. Read more about Square here. You get the card reader free when you set up an account. Though I do almost all of my journaling digitally now, I still run into the occasional instance where it’s just quicker to snag some pen and paper and scribble ideas and thoughts down. These journals from Moleskin are cheap, take up very little space and the paper inside writes quite smoothly with any pen that’s nearby. They come in lined and blank versions. I almost always use blank books because my note taking is a little unstructured. Yeah… so, this is my wallet and these are my keys…. I don’t like a lot of things in my pockets so I keep them in the zippered back pocket of my bag. A lot of people ask about my wallet, I got it from “Mighty Wallet by Dynomighty Designs”. If you are looking for a thin (and I mean literally paper thin) wallet that can hold a lot and can take a beating (they are all made of Tyvek) that is super affordable. Give these guys a try! I got mine for the design and have kept it because it hasn’t given up on me or my lifestyle. Not yet anyways. Wow… You Made It This Far! I’m Impressed! If you made it this far, I am guessing you found some use or odd entertainment in it all, just like I often do. I know it’s weird but I just love reading how other people do the exact same things I do, but differently! So what do you use in your day to day? Do you have some better suggestions for me?If so, leave them in the comments below! I’d love hear about them!